I wouldn’t dare knock Ottawa Hills, Ohio. It’s too green, too pretty, and too loaded. It was always the place to be: the rich kids lived there, the prettier girls lived there, and if you needed to get away from the police all of a sudden, you could cut through people’s yards and be across Central Avenue in no time. As outsiders looking in, we were always sold on Ottawa Hills. 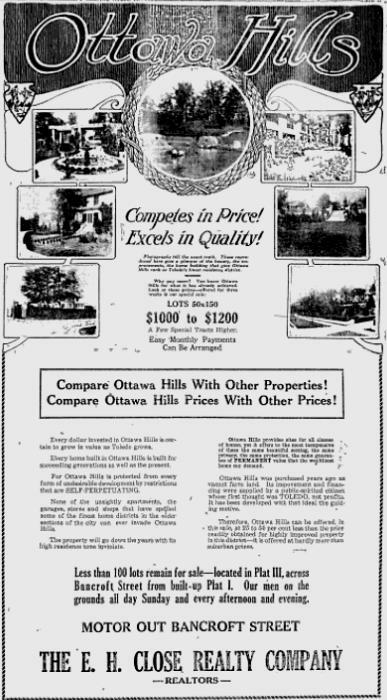 At its birth in 1915, Ottawa Hills needed to be sold to Toledo home buyers and newspaper readers. The August 7, 1915 announcement (click for larger). The party line on Ottawa Hills is pretty well known: John Willys acquired 1,200 acres along Bancroft west of Secor and enjoined the E.H. Close Realty Co. to sell it and build it into a community. 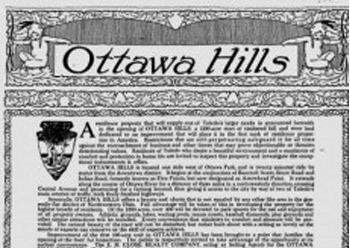 And sell it, they did: advertisements for Ottawa Hills were a common sight in The News-Bee for years to come. That’s because covenants excluding racial and ethnic groups were not uncommon at the time. In fact, the Ottawa Hills Company excluded “any Chinaman or person of the Mongolian race,” in spite of the fact that less than 0.1% of Toledo’s population at the time was Asian-American, according to Bourgeois nightmares: suburbia, 1870-1930 by Robert M. Fogelson, a book which discusses the subject in depth. 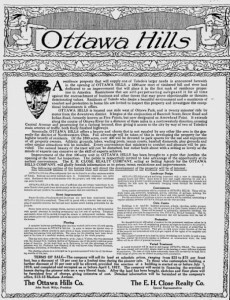 There are also some personal recollections about covenants in Ottawa Hills here on the website of James W. Loewen, whose book, Sundown Towns, recalls and updates the phenomenon of laws and restrictions designed to keep out everybody but whites from towns and suburbs. It’s a moot point now however: the Supreme Court decided in 1948 that courts could not enforce such covenants. The bombardment continued well into the big era of Toledo prosperity known as the 1920s. In 1924, residents voted 58-37 to incorporate itself as a village. Even before the election, The News-Bee determined that if Ottawa Hills decided to incorporate, it would immediately lead the county in per capita wealth (the paper then proceeded to list residents, and the value of their personal property!). Shortly after the incorporation vote, however, Ottawa Hills found itself without any money. The task of recording plots in the county recorder’s office would take two months, no election could be held, and could not obtain money (except by borrowing) until March of 1925 (but by the looks of things they worked their way out of it). Oddly, just days after incorporation, realtor Elmer H. Close died suddenly in his Ottawa Hills home at age 50. The News-Bee described his real estate development as “the most extensive of any individual or firm in the city,” covering over 5,000 acres. A 1927 advertisement backed up the claim that the E.H. Close Co. was a major Toledo developer, even three years after his death. It wasn’t until 1979 that Ottawa Hills was able to expand substantially. On July 27, ground was broken on the Hasty Hill Farms, a $40 million development on 135 acres west of “old” Ottawa Hills. The subdivision was on the land of attorney Edwin G. Marshall and Al Reuben and his Hasty House Farms (at one time Hasty House Farms, the thoroughbred horse farm located there, was a stable of some repute, leading the nation in winnings in 1955). If memory serves me correctly, there were developers determined to build up either Hasty House Farms or the former Stranahan estate across the street. Developer Robert Cavalear announced plans to build a “modern-day Ottawa Hills” on the estate property on the other side of Central Avenue in 1973, but met up with an immediate public outcry that resulted in Wildwood Preserve Metropark, now a crown jewel in the local Metropark system (in my opinion). We’ll save that, and the story of the Stranahan Estate, for another day. Books I’d like to read about the subject include A Promise Kept: A History of the Village of Ottawa Hills by James C. Marshall, Maumee, Ohio: Woodland Publishing, 2003. Do you have a story about the Ward Canaday estate and the race track and stables across the meadow? I don’t. I mentioned him in a post I did about the King and Queen of Greece visiting and I assume you’re talking about Hasty House Farms – if that’s the case it’s been on my list for quite a while to write about Al Reuben. Always been a big horse racing fan.